When Damon Albarn’s personally-assembled new group (consisting of the Clash’s Paul Simonon on bass, the Verve’s Simon Tong on guitar, and Tony Allen, Fela Kuti’s lifelong drummer) debuted its album in England late last year, both Albarn and Simonon commented that it is “a very London record.” The comment could have been a reference to the capital city’s cross-cultural landscape, or its multi-faceted musical history, but its geographical spirit isn’t so much cultural as it is meteorological. The Good, The Bad, and The Queen is a weather record. Its murky atmosphere and reluctant tempos are both product of and tribute to England’s grey, slanted light, damp streets, and salty coast. Beyond that, it’s an album about living under the impending cloud of wartime — always threatening a downpour, even when the sky is still. Its regional specificity isn’t the only thing that might make The Good… a difficult listen for Americans. Thus far, American musicians have only seemed capable of delivering war commentary that plays like a beer commercial (Toby Keith’s “Courtesy of the Red, White, and Blue,” Green Day’s “American Idiot”) or throwback songs that attempt to recreate the scathing satire or patient compassion of Springsteen or Dylan (Bright Eyes “When the President Talks to God” or M. Ward’s Post-War). The Good, The Bad, and The Queen refuses to partake in flag-waving, or even argumentation, and instead delivers a reflection on the shadow the war cloud casts over a doldrums day in London. The album contains no reflection on what it means to take a stand for one’s country; only afternoons in the pub, a televised feed from Iraq in one ear, the doorframe’s drizzle in the other. The listlessness of The Good… is somewhat surprising, given that three of its members come from bands whose best music is exceptionally focused. If there are traces of the Clash’s punch, the intricate patterning of Fela, or the crafted pop of Blur, they exist only as distant echoes. The piano singalongs Albarn wrote for Blur are certainly present here, though “Herculean” and “The Good, The Bad, and The Queen” are broken, bombed-out skeletons of what ten years ago might have been pop hits. For a band that includes Tony Allen, the dated drum programming that backs “Herculean” seems entirely unnecessary, and one can only imagine it is the doing of overrated head producer Danger Mouse. Allen’s abilities are sadly underutilized, though his hushed, unmistakable playing elevates songs like “History Song” and “Nature Springs.” The heart of the album belongs to Simonon’s cotton-swab dub bass. His lumbering, half-witted, and exceedingly soulful playing has found a home here, delivering humanity to songs often on the verge of total obliqueness. At its best, Albarn is able to capture with The Good, The Bad, and The Queen some of what he heard as a young man listening to “Ghost Town” by the Specials, or the Clash’s “Straight To Hell.” Both those records described a Britain lost and displaced, degraded by political machinations and waves of modernization. But more than that, they vividly conveyed overcast skies and loneliness, which is why they spoke to teenagers like Albarn, in Britain and beyond. 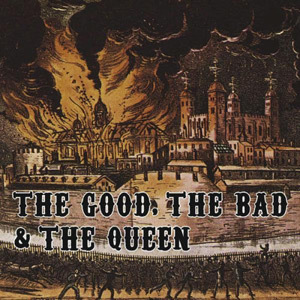 Whether The Good, The Bad, and The Queen goes on to represent a time of worry and isolation, or only the muddled miscalculations of insulated musicians, the confusion and weariness embedded in this music will long remain a time capsule reminder of 2007.